Technology Research Association for Single Wall Carbon Nanotubes (TASC)—a consortium of nine companies and the National Institute of Advanced Industrial Science and Technology (AIST) — is developing voluntary safety management techniques for carbon nanomaterials under the project (no. P10024) “Innovative carbon nanotubes composite materials project toward achieving a low-carbon society,” which is sponsored by the New Energy and Industrial Technology Development Organization (NEDO). As a direct result of the project, we have published following a document as a means of carbon nanomaterials safety management. 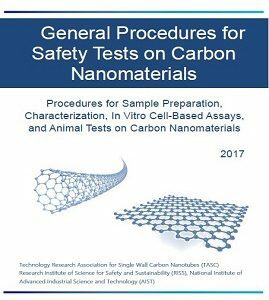 We hope a document is helpful with regard to voluntary safety management of carbon nanomaterials. This document describes the procedures for in vitro cell-based assays and those animal tests that supplement in vitro cell-based assays as simple and rapid safety evaluation methods for voluntary safety controls, to be implemented by business operators that handle carbon nanomaterials. The test procedures described in this document can be applied to the health and safety management of workers in manufacturing- or processing-related facilities handling carbon nanomaterials, regarding their impact on human health through respiratory routes, since workers involved with the manufacturing of carbon nanomaterials are assumed to be at the highest potential risk of exposure. The characteristics of this testing method are (1) the stable and uniform dispersion of carbon nanomaterials in liquids, followed by the measuring of the dispersion conditions and properties of the liquid; (2) the evaluation of the dispersion conditions and the properties of carbon nanomaterials added to a cell culture medium for the in vitro cell-based assays of liquids administered in animal tests; (3) the selection of the impact of carbon nanomaterials on cells and animal tissues, that is, biological indices (endpoints) to select test methods that eliminate, as far as possible, impediments arising from carbon nanomaterials on such findings; (4) the quantitative analysis of carbon nanomaterials found in biological tissues after intratracheal instillation into animals. 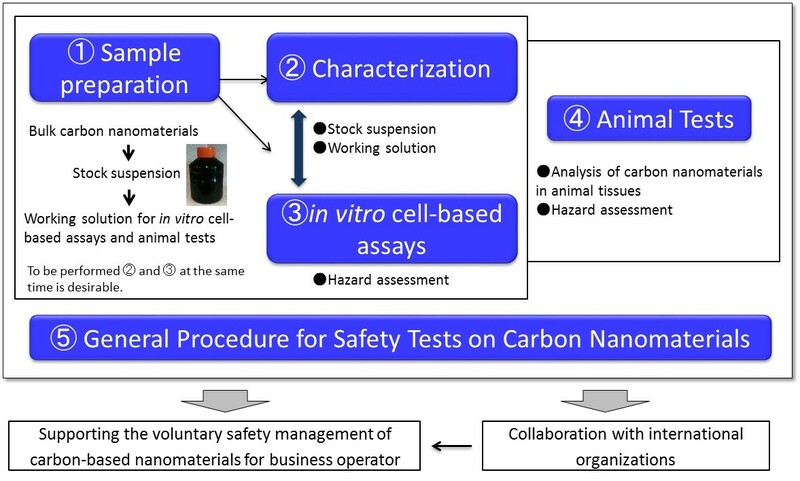 The preparation of samples for safety tests on carbon nanomaterials and their characterization, as well as cultured cells and animal testing, are summarized in following figure. Japanese ver. :Jump to the Japanese page.